Of late, Iceland has embraced innovation. Not all of the new ideas have worked out, of course. Its embrace of financial derivatives and related mumbo-jumbo led to a complete collapse of the country's economy in 2008. But the island nation does other things quite well. For instance, Iceland bailed out the people who were harmed in the financial disaster and imprisoned the bankers and financiers who caused the problems. The country also embraces green, sustainable electric power. Eighty percent of its electricity comes from geothermal sources. 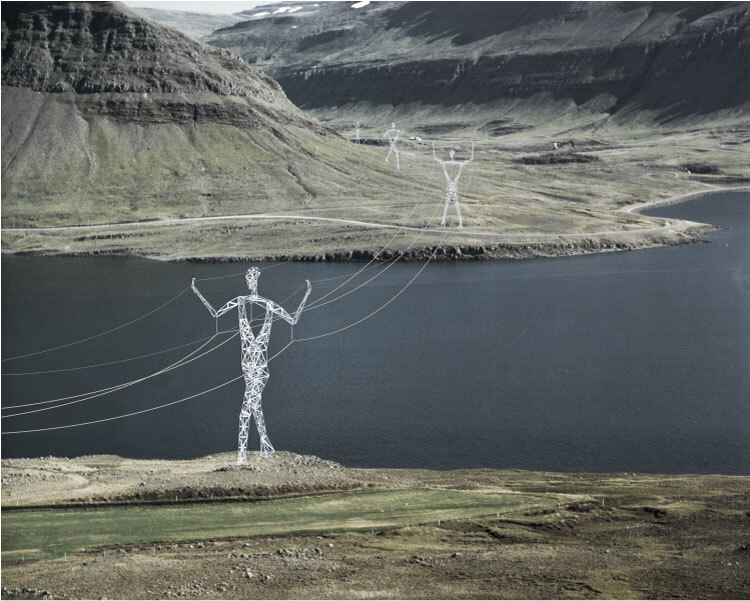 Iceland now also has an attractive way of distributing this green electricity: a network of pylons that resemble slim, solemn humans. Iceland is trying to eliminate the mundane, ugly transmission towers that gash through the landscape. Landsnet, Iceland's publicly run power system, sponsored a design competition to get new ideas for its 220-kilovolt transmission towers. With the help of the Association of Icelandic Architects, the award went to Choi+Shine, whose officers are located in Boston, London and Seoul. The design, "The Land of Giants," respects the environment while meeting criteria for lifetime performance and cost. 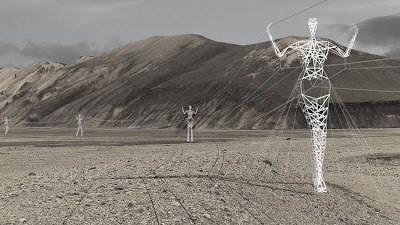 "The pylon-figures can be configured to respond to their environment with appropriate gestures," Choi-Shine says. They can be stretched to gain increased height, crouched for increased strength or strained under the weight of the wires. "The pylon-figures can also be arranged to create a sense of place through deliberate expression. 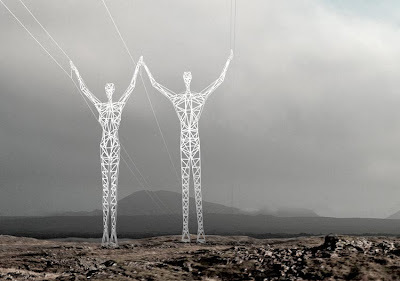 … The pylon-figures can be placed in pairs, walking in the same direction or opposite directions, glancing at each other as they pass by or kneeling respectively, head bowed at a town. "Despite the large number of possible forms, each pylon-figure is made from the same major assembled parts (torso, forearm, upper leg, hand, etc.) and uses a library of pre-assembled joints between these parts to create the pylon-figures' appearance. This design allows for many variations in form and height while the pylon-figures' cost is kept low through identical production, simple assembly and construction." Choi-Shine predicts that the pylon-figures "will become an unforgettable experience," taking on "a quiet authority, belonging to their landscape yet serving the people."